Jane's analyst at FCCT panel implicates "Grey Wolves" terror organization in Bangkok blast - created and for decades run out of the US embassy in Ankara, Turkey. August 25, 2015 (Tony Cartalucci - LD) - The means, motivation, and opportunity have all already long been established linking last week's unprecedented terror attack in Bangkok to ousted US-backed dictator Thaksin Shinawatra and his foreign sponsors. It has also been established that nearly all of the potential suspects these interests may have used to carry out the bombings are also linked to US interests. The bombing occurred as Thailand prepared to move forward with a new national charter and as additional measures were being put in place to fully uproot Shinawatra's political networks once and for all. The bombing also follows a February double bombing just down the street in the popular Siam shopping district - both incidents involving nearly identical bombs and using identical means to put them in place before they detonated. Eager to exonerate Thaksin Shianwatra - leader of a client regime the West has spent a decade and billions of dollars propping up - narratives involving foreign terrorists have been promoted across the Western media. The Foreign Correspondents Club of Thailand (FCCT) - a collection of foreign journalists from prominent Western news networks - conducted a panel to specifically lay the blame upon an obscure Turkish-based terror organization called the "Grey Wolves." And while Forbes assures readers that domestic groups, including "political dissidents" could not have been responsible, neither Forbes nor the "experts" they cite qualify this claim. 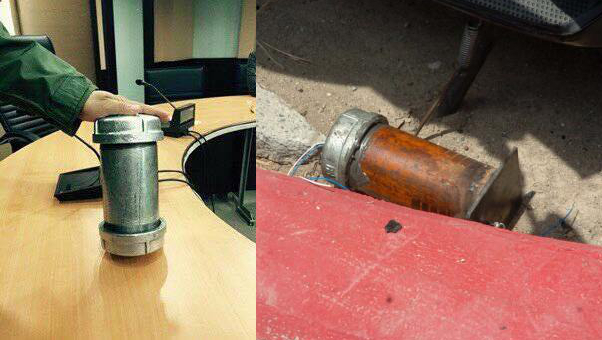 Images: Side-by-side comparison of a recreated pipe bomb used in last week's bombings (left), and a pipe bomb recovered last year (right) after two of Shinawatra's "red shirt" terrorists accidentally killed themselves while transporting explosive devices. In fact, large pipe bombs almost identical in make and material to those used last week and in the double Siam bombing, have been at the center of an ongoing investigation stretching as far back as 2010 where an apartment exploded in Nonthaburi as Shinawatra's "red shirts" were attempting to assemble explosive devices. A similar incident occurred in 2014 amid anti-Shinawatra protests, where two of Shinawatra's "red shirt" terrorists accidentally killed themselves when a large pipe bomb they were carrying exploded. The fact that all of these apparently linked incidents occurred at high-points of Thailand's internal political struggle, suggests strongly that last week's bombings were a continuation of pro-Shinawatra terrorism. The inclusion of foreign terrorists to carry out these attacks - if true - would suggest that Shinawatra has been furnished with assistance from foreign intelligence. Claims that the little-known "Grey Wolves" may have been involved, and the suspicious insistence almost immediately after the bombing by Western news outlets including the BBC that "Uyghurs" may have been involved, only further indict Shinawatra and his foreign sponsors. Forbes' attempt to portray the "Grey Wolves" as being behind the blasts in Bangkok include several obvious omissions. First, the Siam bombings in February occurred months before the alleged slight the "Grey Wolves" supposedly attacked Bangkok for last week. Uyghurs Thailand detained were extradited to China in July, months after the Siam blasts. Forbes and the "experts" they cite never so much as mention the Siam bombings. Forbes fails to mention that the attack on the Thai consulate was led by the World Uyghur Congress, a political front for China's armed Uyghur terrorist groups, that is based both in Washington D.C. and Munich and is funded annually by the US State Department via the National Endowment for Democracy (NED). "We are here to protest Thailand's and China's human rights abuses. The Chinese cruelty has spread to Thailand," Seyit Tumturk, vice president of the World Uighur Congress, told Reuters outside the Thai Embassy. World Uyghur Congress Human Rights - $275,000 - Uyghur Human Rights Advocacy and Training To enhance the ability of Uyghur prodemocracy groups and leaders to implement effective human rights and democracy campaigns. The World Uyghur Congress will organize three training seminars for pro-democracy Uyghur groups and leaders and conduct international advocacy campaigns on human rights for Uyghurs. One wonders whether the "experts" at the FCCT panel intentionally omitted this information, or never bothered to look into who in fact funds these groups. In addition to the World Uyghur Congress, there is documented evidence tying the "Grey Wolves" terrorist organization directly to both NATO and the United States military itself. If the Grey Wolves were present at the consulate attack taking part in the World Uyghur Congress' protest and responsible for the recent bombing in Bangkok - yet another US-funded political front finds itself allied with terrorists literally mass murdering people around the world. The US-NATO Created the "Grey Wolves"
In the late 1970s, armed bands of Gray Wolves launched a wave of bomb attacks and shootings that killed hundreds of people, including public officials, journalists, students, lawyers, labor organizers, left-wing activists and ethnic Kurds. During this period, the Gray Wolves operated with encouragement and protection of the Counter-Guerrilla Organization, a section of the Turkish Army's Special Warfare Department. 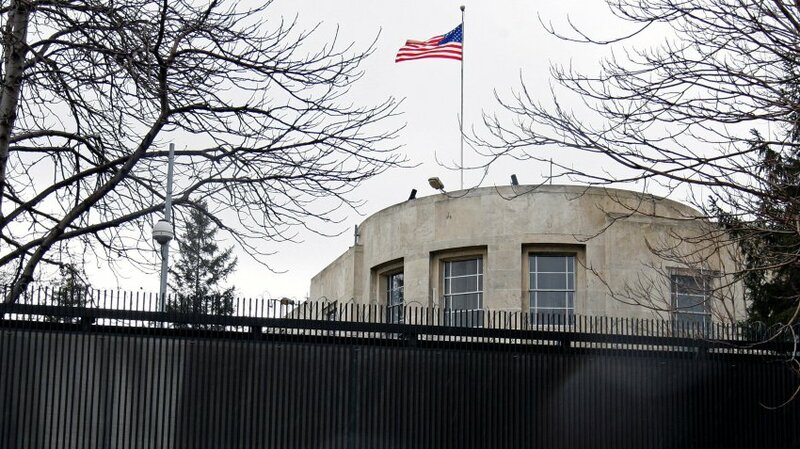 Working out of the U.S. Military Aid Mission building in Ankara, the Special Warfare Department received funds and training from U.S. advisors to establish "stay behind" squads of civilian irregulars who were set up to engage in acts of sabotage and resistance in the event of a Soviet invasion. Similar Cold War counter-guerrilla units were created in every member state of the North Atlantic Treaty Organization. But instead of preparing for foreign enemies, these operatives often set their sights on domestic targets. How this "origins" story was omitted from Anthony Davis' FCCT presentation and why the implications that a US backed terrorist organization may have been involved in a terrorist bombing aimed at undermining a government that has ousted a US-backed client regime - deserves an answer from both Davis himself and the FCCT and the multitude of Western networks repeating these claims without question. Attempts to ask why this information is repeatedly omitted have resulted in either silence or personal insults leveled by prominent Bangkok-based journalists, including the BBC's Jonathan Head. According to a 2009 New America Media report, the "Grey Wolves" are alleged to also be operating training camps in western China to train armed terrorists - fitting in nicely with the United States' own stated "grand strategy" of maintaining "primacy over Asia" by encircling, undermining, and containing the rise of China. Targeting Thailand as it makes unprecedented strides away from dependency on the US and toward stronger ties with Beijing also exposes a common "motivation" between proxy attacks on both China and Thailand carried out by clearly US-NATO backed political and terrorist organizations. It is clear that for decades, as a matter of documented fact, the "Grey Wolves" served a tool of both internal and geopolitical coercion on behalf of the US-NATO carried out through asymmetrically warfare - another example of US state-sponsorship of terrorism not unlike its role in creating Al Qaeda in the mountains of Afghanistan in the 1980s to advance its geopolitical ambitions in Central Asia. If the "Grey Wolves" were indeed linked to the latest in a string of terror attacks carried out on behalf of the ousted US-backed Shinawatra regime, this would indicate that indeed, the US "pivot to Asia" has turned into a bloody brawl.